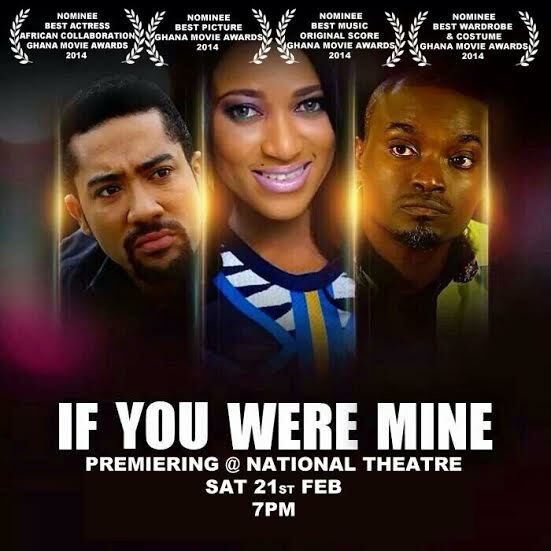 From the stables of BarCo Studios comes ‘If You Were Mine’, a movie starring Majid Michel, Rukky Sanda, Kweku Elliott, Roselyn Ngissah, Maame Adjoa Adom Obimpeh, Salma Mumin and Pascal Amanfo who also wrote and directed the movie. ‘If You Were Mine’,tells a story of Max who meets a mysterious lady in a nightclub, before he could say ‘Jack’, this lady is in his house and on his bed. Before he could blink, Ashanti the lady in the centre of it all has stolen every fibre of space in his heart. Things move so fast that by the time he realizes, he’s already proposed. Becoming more interesting, the dilemma begins with the realization that this lady could she be playing games and before he can find answers, a brawl ensues with an ex-lover of his mysterious lady, waking him up to the reality of a wife and son he is trying to accept. With the premiere of this movie coming up soon, movie enthusiasts can start getting their tickets to see the movie on the 21st of February, 2015, at the National Theatre, Accra, Ghana. ‘If You Were Mine’ is written and directed by the multiple awards winning director – Pascal Amanfo and produced by BarCo Studios.